Veterinarians and animal care specialists are faced with unique, medicine-related problems that typically are not encountered by physicians. We help solve these problems for small and large animals-pets, exotics, zoo animals and livestock. Here are just a few examples of how we can help improve animal health by compounding medicines into easy-to-use and economical dosage forms. Trying to make a dog or cat swallow a tablet is not always the easiest thing to do. We can prepare medicines into easy-to-give flavored dosage forms that animals devour. Cats like sardine and tuna flavors. And there are a variety of flavors available for other animals. Commercial animal medicines may be available in only one tablet size. Giving that tablet to a dog or to a steer poses a problem. The tablet may be too large for the dog, and an excessive number of tablets may be necessary to meet the needs of the steer. We can compound dosage forms that are just the right size for any animal. We make medicine easier to use. Animal medicine manufacturers often stop producing medicines and dosage forms for which there is a low demand in the market. However, there is still the occasional need for such products. We can obtain medicines in liquid and powder forms and use them to prepare dosage forms that are often superior to the discontinued formulas. It is easier and usually less costly to give each of 10 cats one capsule rather than four. We can compound capsules that contain several ingredients. In a similar manner, we can prepare solutions with more than one medicine for delivery by nebulizer – this is particularly useful for treating horses. Animals may have skin problems that do not respond to single-ingredient creams, ointments or gel. The veterinarian may want the animal to have two or more additional skin preparations. Using multiple medicines in separate containers is inconvenient. We can compound a number of medicines in needed concentrations into easy-to-use single products. Why not give them customized care? 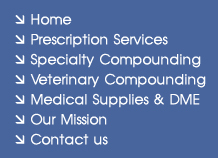 Ask your veterinarian or pharmacist about compounded medications.